We Defy Augury: If They Build It Who Will Come? Wall Street Journal – "The Halfpipe Was Set to Rule Winter Sports. Now It Is Dying"
"Only 13% of U.S. ski resorts last season had a halfpipe, the giant, open-face cylinder through which riders swoop and fly. That was down from 34% a decade ago, according to the National Ski Areas Association. 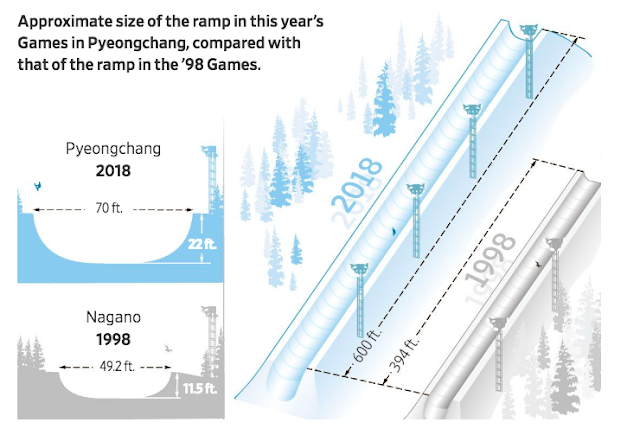 Only 8% of ski areas last season had a superpipe, a halfpipe that’s Olympic sized or close to it. An appetite for bigger and bolder tricks fueled a near doubling in size of Olympic halfpipes to 22 feet high from 11.5 feet at the event’s 1998 debut. Ski resorts upgraded to bigger halfpipes, which are pricier to build and maintain. But far fewer riders dare plunge down the larger pipes’ walls, so many resorts have stopped building a halfpipe altogether."